I like your qoute of doing things that others arent...and the whole doing small things to get the big things is genius!! Have a great weekend, petite souris ! and a sweet weekend to YOU too! What? Nobody ever pulled a wet willy on you at summer camp? Actually, there were a lot of silly band names in the '60s; my favorite weird name was Ultimate Spinach, although Holy Modal Rounders comes in a close second. Wet Willie now that's silly! Isn't it amazing what people will call police out to fix? I'm smiling! Hope you are too! The New York Post has a feature called 'Wierd but True' about odd stories from around the country. I think the squirrel/cardboard story might fit in well there. 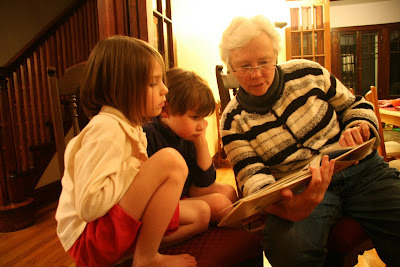 Of course you got me curious...which children's books did you read last night?? I went to Barnes & Noble this afternoon and did some exploring. There is a great deal of fantastic children's literature out there but I MUST stop buying it all. I am running out of room. The weekend has been sweet thus far, I hope it continues. overall silliness is fairly crucial - maybe it should be compulsory? mags - welcome to the mouse! looking forward to more visits to your corner of the blogosphere. welcome to the cyberhood! rlb - notch thinks that a lot of humans do get worked up over the silliness things, like mice for one thing! baino - re calls to the police, our little city does seem notoriously hilarious, if we can believe the police blotter reports! megan - smiles....and more to come, the morning is dawning bright and clear! gary - a few of the books titles I don't remember...but the one k is reading in the picture is where the wild things are....we took turns on that one as it is one of my favorite books to read aloud. the kids also brought down the 'twelve dogs of christmas' - a hilarious adaptation of the christmas classic, but with dogs! I never saw it before and now I want to buy copies for all the dog lovers in my life...it starts out on the first day of christmas my true love gave to me a poodle in a dog house. oh re purchasing children's books, at least you have a good excuse! I still buy children's book to keep at the house if I run across one that really, really strikes my fancy! betty - carry on with more of an excellent weekend and may it last through the week, and over the month to the year!! Oh, Yes. Where the Wild Things Are is a fantastic choice. I hear that there will be a major motion picture coming out soon based on this book. I hope it is amazing. I never heard of the !2 dogs book either. I'll have to check it out. If one of the dogs is a Saint Bernard then I have no choice but to purchase it. "You're only a pack of cards". OMG! You are raising a mouse! I used to raise mice. Had to save them from the pet store where they were purchased to feed snakes. I couldn't bear it so I became a mouse mama for a number of years when my children were small. My husband and sons loved them. They built they cool tunnels out of colored but clear plastic for the mice to get exercise from one end of their cage, round, down, up and over. It was great fun. 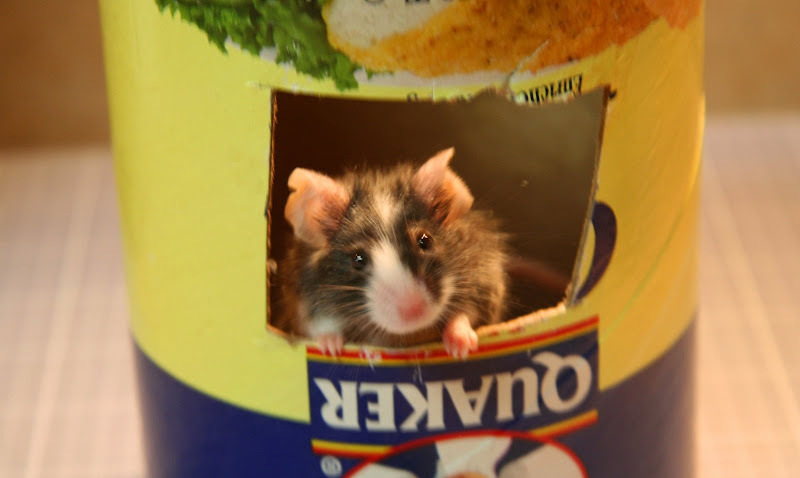 What a blast to see your little guy peeping out of the Quaker box! I am smiling. Overall silliness is the means to perfect success of an evening out for supper with friends! Love the pic of the hamster! This is exactly why most newspapers believe the secret to survival is to go local, local, local. 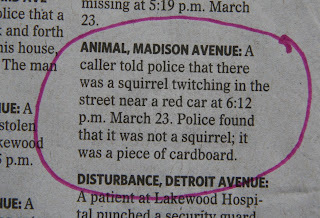 Why on earth would anyone call the cops over a twitching squirrel?? ?